The majority of the folding / inflatable kayaks are of the touring / expedition type that charactistically have large open cockpits. 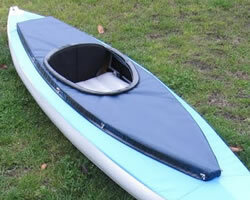 'spray deck covers' for folding and inflatable kayaks are different to 'waist covers' made for hardshell kayaks (plastic / glass fibre) becuase hardshell kayaks typically have small cockpit holes. 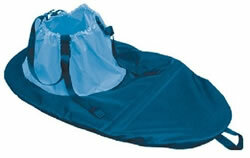 There are two main types / designs of spray covers for folding kayaks - one with oval cockpit holes and typically used with a removable elasticated waist skirt that is placed over the rim. The second design has the waist skirts integrated with the main spray deck cover - an all-in-one. This second design has a vertical opening along the left side of the waist skirt that continues to the edge of the spray deck cover. This enables you to open the 'skirt' as wide as much as you want, creating a much bigger opening for easier entry / exit, as opposed to having to wiggle through a smallish keyhole cockpit. Spray covers can be custom made to fit your kayak. There are two types of cockpit covers. One is very similiar to the spray deck cover that covers the whole open cockpit but without the individual paddler cockpit holes, and the other is just a small cover for the individual paddler cockpit holes. Some spray deck covers versions have integrated cockpit covers - basically a 2 in1 deck cover. Primarily only for spray decks that have raised keyhole hoops. Waist skirts are normally included as standard when purchasing a keyhole type of spray deck cover. The ones listed here are available as replacements or as improvements to existing skirts - please check keyhole size with skirt size. Comments: Orange grab handle. Includes perimeter D-rings and attached cockpit covers. Use in either in a 2 paddler role OR in a solo paddler role. It is not meant to be a 3 paddler spray cover. If used on a 550, the central cockpit becomes a handy hatch to access centrally stored kit. Kayaks: Wayland Amazon II 520 / 550, Wayland Mk II Zoska / Formoza 520 / 550, all old and new Kleppers up to and including 545. Comments: The central cockpit becomes a handy hatch to access centrally stored kit.